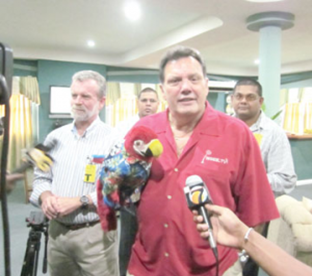 CBS-TV 's Joey Stevens, as he arrived in Guyana with his puppet parrot, his trademark on his TV Weather show– One Caribbean weather Channel. He is accompanied by Mr Brian Lilly, owner of One Caribbean Weather and WSEE TV, on his right. Here are two videos, each about 28 minutes, by a CBS-TV team led by weather forecaster Joey Stephens. The videos feature various aspects of Guyana’s geography, its people, forests, and eco-tourism. A TEAM from the popular ‘One Caribbean Weather’ and WSEE TV, including weather forecaster Joey Stevens and his puppet parrot, Bob, arrived here yesterday to produce shows on Guyana’s tourism that will be aired on CBS and the ‘One Caribbean Weather’ channels. They did an aerial shoot of Georgetown yesterday, and are to tour the city today as part of theone-week stay to produce two half-hour shows for a United States audience estimated at some30 million. Bob with THAG President Paul Stephenson, will visit the Kaieteur Falls, the Iwokrama Rainforest Centre, the Essequibo Islands and other parts of the country, officials said. Mr. Stevens, WSEE’s Chief Forecaster, on the websiteonecaribbeanweather.com, describes Guyana as “The Lungs of the World,” noting that it is doing great with a low-carbon development strategy, and that President Bharrat Jagdeo was recently conferred with the United Nations 2010 ‘Champion of the Earth’ award. Stevens told reporters at the Cheddi Jagan International Airport that featuring a country on his weather show helps to boost its tourism sector, and give positive recognition to what tourists can expect when visiting. What was important, he said, was that the rest of the world will be seeing what Guyana is all about and the One Caribbean Weather programme will put Guyana at the forefront so that others can experience its rich flavour and culture. “We will be showing the world what is here in Guyana to entice them to visit and experience Guyana for themselves. I have been told that many people visit Guyana to see all the natural things here, like the waterfalls and rainforest. Guyana is different from the rest of the Caribbean with its natural beauty,” he noted. Director of the Guyana Tourism Authority (GTA), Mr. Indranauth Haralsingh, said inviting the team to Guyana will help build the country’s destination and awareness images. He said this simple investment will be huge for Guyana, since it will allow about 30 million people to view various attractions as well as Guyana’s unique culture. “The more people get familiarized about us, the more it will help to create a demand for the country’s tourism industry,”, he said. (Stabroek News – Feb 26, 2011) Around 7:15 pm this evening , the PNCR confirmed that retired brigadier David Granger would be its presidential candidate for this year’s general election. 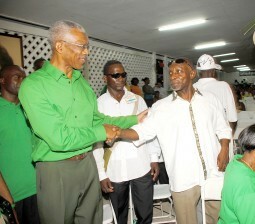 The decision came on the third count of the ballots at today’s special PNCR congress. An announcement was to be made at 3.30 pm today but up to 7 pm there was none. Congress Place sources said that on the first count economist and former finance minister Carl Greenidge came out slightly ahead of Granger. Following a challenge there was a recount and sources said that Granger came out slightly ahead. A third count confirmed this decision.